Check out our list of interesting bridge facts. 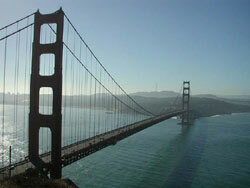 Learn about famous bridges such as the Sydney Harbour Bridge, Brooklyn Bridge and Golden Gate Bridge. Understand some of the history behind bridge building, read amazing information related to suspension bridges, arch bridges, beam bridges and more while enjoying a range of fun trivia for kids. Common types of bridges include beam bridges, arch bridges, suspension bridges, cantilever bridges, truss bridges, and cable-stayed bridges. Bridge designs depend on their intended function, financial resources and also the type of terrain where they are constructed. While an arch bridge might be suited in one situation, a suspension bridge might be suited in another. The Zhaozhou Bridge is the oldest standing bridge in China and the world’s oldest stone segmental arch bridge. Built in 605 AD, it is still standing strong today, over 1400 years later. The Inca civilization in South America made use of rope bridges in the Andes Mountains before the Europeans colonized in the 1500’s. These rope bridges spanned canyons and gorges, allowing easy access to otherwise difficult to reach areas. While they were strong and reliable, repairing the bridges was a dangerous job that often ended in death. During the Industrial Revolution of the 19th century wrought iron was introduced into the design of large bridges. Wrought iron was later replaced by steel because it has a higher tensile strength. The first welded road bridge was designed by Polish engineer Stefan Bryla in 1927. The Sydney Harbour Bridge in Australia can rise or fall up to 18 cm (7.1 inches) depending on the temperature due to the steel expanding or contracting. It also features 6 million rivets and weighs 39006 tonnes. The Brooklyn Bridge in New York, USA joins Manhattan and Brooklyn over the East River. When completed in 1883, it was the longest suspension bridge in the world (remaining so until 1903). It features average daily traffic of around 145000 vehicles. The Golden Gate Bridge in San Francisco, USA is a well known suspension bridge that was completed in 1937. It has a total length of 8981 feet (2737 metres) and features 80000 miles (129000 kilometres) of wire in its two main cables. The longest suspension bridge in the world (as of 2010) is the Akashi Kaikyo Bridge in Kobe, Japan. It opened in 1998 and spans an incredible 1991 metres (6529 feet). Check out our top ten list of the longest bridges in the world.